What Should We Pay Attention to the Balance of Tower Crane? Most of people always ask some questions: Assuming that the crane is perfectly balanced with no load, though, what happens when a crane picks up some load with the working arm? Isn’t the crane unbalanced then? 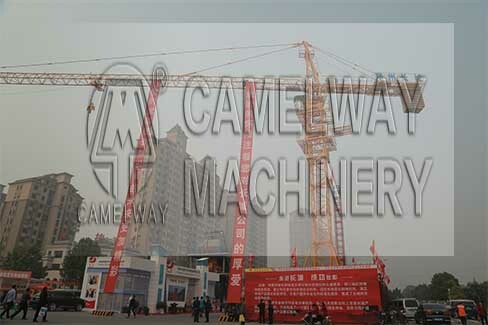 What should pay attention to the balance of tower crane? Maybe we can see that the crane is balanced directly over the mast by having a long working arm with no load on one side, and a shorter arm on the other side. It makes a counterbalance through this way. If the minimum lifting capacity of crane and the load exceeds the minimum load valve, the crane would be unbalanced and may cause huge accident. Then how to keep the balance ? It is better to move the working arm with no load and find out the critical load.The crane has a load calculator which will display the actual weight of load being lifted. And for any particular length and angle (with respect to horizontal surface) of the working arm, the chart or calculator shows the maximum load that can be lifted for the particular position on working arm. What’s more, the crane operator should shift the weight horizontally according to the requirement while lifting the material. Also, the crane operator need to be very well trained and experienced.